I need a new pair of jeans. No... really... I do. My Paige Hidden Hills, straight legged jeans recently bit the dust The fabric went all pucker-y in places, which is not surprising, since I wore them all the time and evidently washed the stretch right out of them. 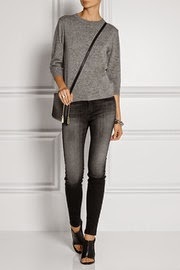 My J-brand skinnies still look good, but I vowed last fall to replace them. They're low rise. And therefore difficult to keep up, and thus enormously annoying. I have other jeans, of course. But not ones that I love. Not the "perfect jeans." So. I begin a journey this week. And what does this journey have to do with that guy pushing the rock? 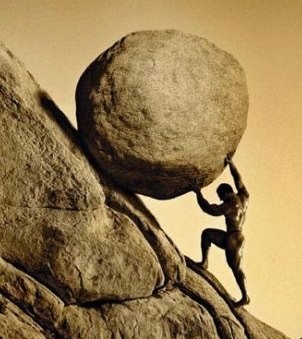 Well, that's King Sisyphus. According to ancient Greek mythology, he got on the wrong side of a bunch of Greek gods and was punished. His punishment was to roll a huge boulder up a hill. And when he reached the top, he had to watch it roll all the way back down to the bottom. Then he descended the hill and began his task all over again. For eternity. And if there's any form of shopping that resembles the fate of Sisyphus, it's shopping for the perfect jeans. Jean shopping is a journey filled with hard work, frustration, more hard work, and frequent, bitter disappointment. And then when you find the perfect pair, they wear out, and you have to start the whole painful process all over again. So, as I said. I am beginning this journey. Again. Well actually, I began it last week. I made one futile trip to the mall and came home empty handed. I hadn't done my homework thoroughly enough. I mean what exactly was I looking for, anyway? 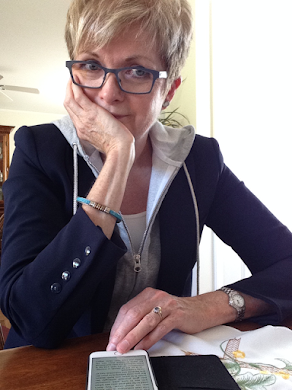 I consulted Net-a-porter.com my go-to source for fashion inspiration. And the editors there say that flared jeans are the "jeans of the season." I know that flares quietly reappeared a season or so ago. But... "jeans of the season?" Images of jeans, like the ones below, are NOT consistent with the image of the "perfect jeans" that I've carried around in my head for the past few years. See, this is the look I have aspired to for a while now. Skinny jeans with flats, or low heels and a sweater, or with high heels and dressed up a bit with a jacket. Black, dark blue, or distressed, full length, cropped, or rolled ... but always... skinny. Or even straight. Like my Paige jeans that have worn out. Still slim, but a bit wider at the bottom and so more easily worn over boots. But flares? I was a teenager in the seventies. We wore flares that were so wide in the leg, and so long that we stepped on them. And the hem in the back always looked chewed up. It took me years (and years) to feel comfortable wearing pants that didn't drag on the ground. Could I actually go there again? Did I want to go there again? 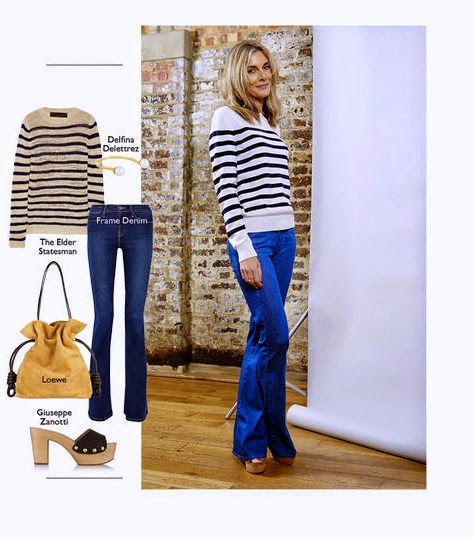 This is a shot of Kim Hersov modeling her take on flared jeans, for Net-a-porter's free, weekly on-line magazine The Edit. I love their features in which Kim and Tallulah Harlech describe how to take trends from runway to real life. The January 15 issue included a "Denim Workshop" with Kim and Tallulah which you can check out here. But, I don't know that I'm ready for flares. I like boot cut jeans though. They could be a good compromise between skinnies and flares, couldn't they? I own a pair of 7-For All Mankind boot-cut jeans from a couple of years ago. I still like them even though I rarely wear them. They look fine with boots, a casual turtleneck, and a scarf. Although, to be truthful, I'd really prefer my skinny Tory Burch cords with this outfit. Or I could pair my boot-cut jeans with this animal print sweater from Eli Tahari. Looks good, I think. Or with a striped tee and my newly re-imagined short, black jacket from Theory. I tried this jacket and tee combination in a post a couple of weeks ago, with my skinny J-brand jeans...and...well... I think I like that outfit better. Now, I do like this Theory silk shirt, v-neck sweater, and long, black Elie Tahari jacket with my boot-cut jeans. And that's good... because I'm getting tired of trying stuff on and going "meh." It seems to me that anything boot-cut jeans can do, skinny jeans can do better. Or more chic-ly. And then I found these jeans in my trunk... where I store stuff that I'm not currently wearing but haven't decided to weed out yet. These are Paige jeans, supposedly boot-cut, but much wider in the leg. They're really more like... flares... actually. I tried them here with my brown, suede, low-heeled Prada booties, a white tee shirt, and my much loved, brown Akris leather jacket. And this wool scarf which I also love. And, that ain't all I love... I kind of love this whole look. With the scarf layered outside...or inside. So what exactly have I achieved today? Hmmm. Let's see. Well, I've done my homework. I researched my topic, learned some stuff about how to wear flares. I've created a couple of outfits that I like with my 7-For All Mankind boot-cut/compromise jeans. 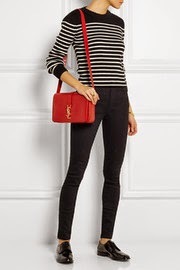 I may have gone some, small way in overcoming my fear of flares; I'd definitely wear these Paige flare-ish jeans with my leather jacket and Prada booties. But, more importantly, I have learned that, while boot-cut may be a good compromise between skinnies and flares, and though flares are the "jeans of the season," my heart is still with a long, lean look. And for that I want a slim or straightleg (even if not a skinny) jean. And one with a higher rise. So, let the journey continue. Armed with a much clearer idea of what I want, and don't want. I'll be off. I've shopping to do. Many, many pairs of jeans to try on...and discard...before I find my "perfect jeans." I know there will be jeans that are too low in the rise, and ones that are too high and feel like they come up to my armpits. There will be jeans that are too skinny and tight in the leg, and ones that are too baggy, or too short, or too big in the bum. There will be jeans that make me feel fat, and ones that will make my legs look like sticks. It's a tough, frustrating journey, the search for the perfect jeans. One might even say Sisyphean. And you know...once I find them. Once I get that darned rock to the top of the hill. I may have to buy two pairs. And thus delay its rolling back to the bottom... at least for while longer. What are your perfect jeans? And is shopping for them a Sisyphean job for you? Manic Monday, Style Me Wednesdays, What I Wore, Passion 4 Fashion, and Fun Fashion Friday. Labels: 40+ fashion, 7-For All Mankind jeans, fashion, fashion over 50, J-brand jeans, Paige jeans, perfect jeans, shopping for jeans, Sisyphus. Boyfriends:). And I'm in need of a new pair of Levis. If I don't come back, send help:). I think you look great in the flares, BTW, in some way even better than the bootcut. 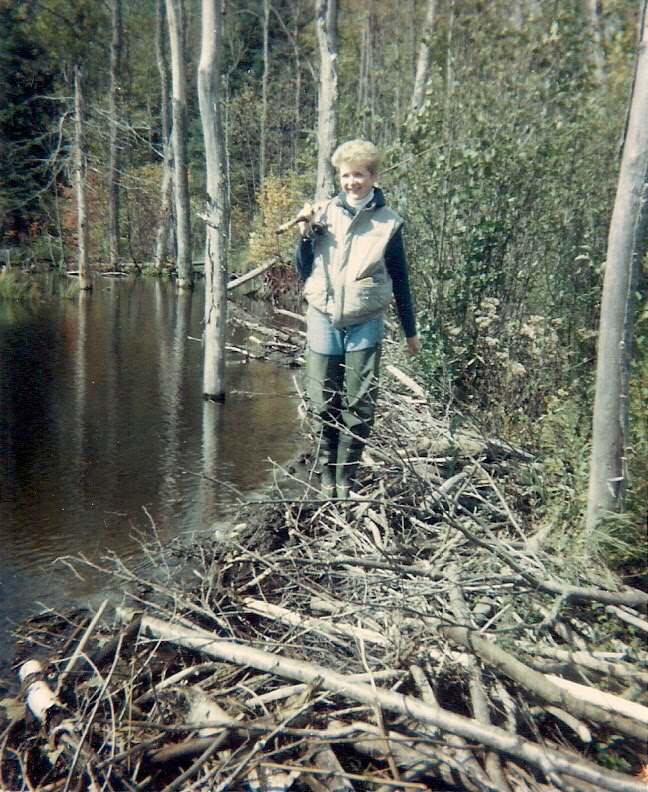 You always look great in your boyfriend jeans, Lisa. I don't know about the flares, though. We'll see. Thanks for reading. Boyfriend jeans are not for me. I can't keep them up and they're always too short. It's so hard to find a great pair of jeans...it's a wonder we don't just give up! You have great legs for most styles of jeans! I have a hard time finding jeans that fit me comfortably and look good. In fact, I haven't worn jeans in a couple of years because I haven't found any I really liked. I like boot cut, on the looser side, definitely not low rise. Right now my favorites are boyfriends and what are sometimes referred to as "cigarette leg" or "slim boyfriend" jeans. I'm liking the slimmer jeans at a cropped length too. Try Frame denim "le high" skinnies and AG Jeans "The Stilt." I do like the flares on you too; you're tall enough to really carry off that look. I tried slim boyfriend..they look great on you. But I found the legs too short for me, or maybe just the wrong proportion. I saw some great Frame and AG jeans on Net-a-porter. I'd love to try them if I could find them here in Ottawa...or even in Montreal. Thanks for the recommendations. I love the boot cut/compromise jeans! I am not a fan right now of flares but check with me in a year, who knows? You look terrific, and thanks for sharing with Visible Monday, xo. Thanks Patti. Thanks so much for hosting Visible Monday. HAHA ... love this post! Shopping for the perfect jean IS a Greek tragedy! Would you believe that after a year and a half of shopping for boyfriend jeans, I finally found the perfect pair ... and now ... they're probably on the way out! LOL. I love flares for some strange reason, but I understand your reaction. When skinny jeans came back into style I had the same negative reaction and held out as long as I could! Anyway, I love all your outfits ... you always put things together SO well! Thanks Dawn. Only thing more painful than jeans shopping is ...bathing suit shopping!!! I will NOT be doing a post on that! Thanks for reading. Thanks. There are so many cuts and styles of jeans now..... it takes real effort to weed through them all, doesn't it? I like the flares with flat sandals in summer look, too. Good luck finding your perfect jeans. I like most types of jeans but for me bootcut are the most flattering. I want to wear flares this year but haven't even started looking for them yet. I know that Zara jeans seem to fit me really well but I would love Paige denim or J-Brand jeans. Of course you look amazing in your jeans. Thanks Lorna. I love Paige jeans. And J-Brand is such good quality...if J-Brand would make a high rise, slim leg jean...I could be perfectly happy. As yet I've only found low-rise. I agree...anything flares and boot cut can do skinnes (or straight leg) jeans can do better. Next time I find a perfect pair, I'm buying more than one. We don't have Anthropologie here. Toronto or Montreal only... too bad. i dread shopping for flared leg jeans. i have short legs and my salvation for the past few years has been the ankle jean, which on me is full length. i also love boyfriend jeans that can be cuffed to fit my short legs. with flared jeans i think i would have to get them altered to fit, an expensive process. i love cigarette jeans and slim leg jeans rather than real skinnies. i love joe's jeans. I too love the ankle jean...except for some styles which are pedal pushers on me. I have never tried Joe's jeans. I remember in high school when we only had Levis and GWG to choose from! I loved this post. You got it right. I love the straight leg jeans too, but you look good in all of them. I'm still smiling at this post. Well, thank-you. You just gave me my first smile of the day. Thanks for reading....and commenting. Gee, thanks, Janie. 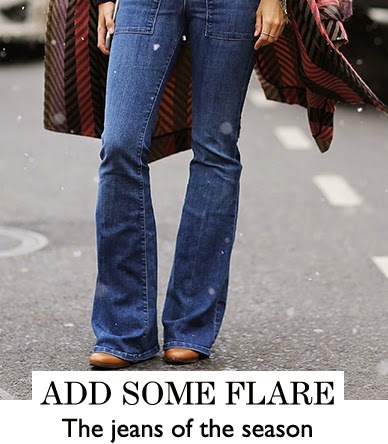 I agree that flares look best with a slim fitting top. I find that slim or skinny jeans look so much better with almost everything. I also like them with a comfortable long top, and don't think that long tops look that great with flares. I will indeed report back when I find new jeans....if I find them! Thanks for reading. Ahh, jean shopping! I can totally relate to that picture :) You're right in that you do need a plan. You also need to be in a particular mood, you know, up for the challenge. I took a long time to embrace skinny jeans but now that I have they are all I wear. I just look better in them. I agree that anything boot cuts can do, skinnies can do better. I too love Jbrand skinnies, but my current favourites are high rise jeggings and skinnies by Paradise Mine, found at Aritzia. You should give them a try. Happy shopping! The reward is so worth it once you find that perfect pair. I will try those. Thanks, Melanie. I love shopping for jeans but used to hate it. Years ago I just had one pair and when they got too worn out, I'd buy the exact same pair to replace them. One day I couldn't find the same ones anymore and had to start from scratch. That was when I didn't like to shop though...now I LOVE shopping! Anyway, I thought all the jeans you tried on looked fabulous on you! Thanks Lisa. And thanks for stopping by. Love the title of this post with its allusion to Greek Mythology. I too, find shopping for jeans to be a difficult task, however it's good that you were able to do some research and better understand what works for you. I am not sure how I feel about flared jeans (l loved them in high school) but the pair you have on look fabulous and you did a great job styling them! Thanks Katie. Not sure if I'll wear them very much though. Still hanging onto my skinny jeans! Thanks for stopping by.